Welcome, welcome on the colourful Wild Bazaar Slot of NetEnt. Here, you will find the stacked wilds, Colossal wilds, linked wilds and x2 Multiplier that can boost your wins. This Arabian themed slot is a 5 reel and 26 payline game that can be played on your favourite devices- iOS and Android! Have a few spins on this video slot for a likely entertaining spinning adventure. During your spinning adventure into the Arabian market of Wild Bazaar, you will find a wide range of symbols. They include well-crafted symbols like 4 colourful treasure chests and exquisite jewels with their price tags. This NetEnt marvel comes up with four Wild Spins Feature that can boost your wins. You can win up to 390 times your stake per single spin. Amazing, right? 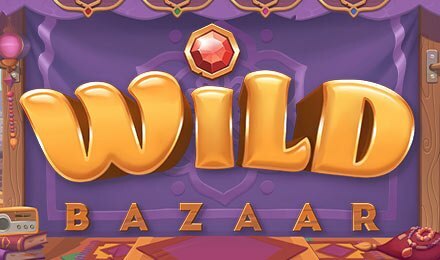 Bet Levels: There’s 1 to 10 Bet Levels on Wild Bazaar Slot. Just pick and choose. Amount of Paylines Selection: All of the 26 payline are fixed. Coin Values: You will find the coin values and it includes the following: 0.01, 0.02, 0.05, 0.10, 0.20, 0.50, 1.00 and 2.00. The main bonus round on Wild Bazaar Slot is an interactive feature table and it showcases a wide range of wild combinations. You have to click on the colourful button to see the various wild spins combinations. This feature interacts, and it will cover the reels wholly, gradually the more wilds are triggered. The wild symbol on Wild Bazaar Slot can substitute for all the symbols on the reels. To activate 1 of the 4 wild spins feature, try to get three or more matching treasure chest symbols that will come into view consecutively on one winning line during your main game. The Wild Spins Feature includes the Stacked Wilds, Colossal Wilds, Linked Wilds and the Multiplier Wilds. They are depicted respectively by the following deep coloured treasure chests: Red, Green, Pink and Blue. When the Stacked Wilds is launched, the wilds will appear in stacks of length four. When the Colossal Wilds is activated, the wild symbols will make an appearance as 2x2 colossal symbols. When the Linked Wilds is triggered, the rightmost and the leftmost wilds will crop up on the same horizontal row. Plus, all of the symbols will change, and it includes chest symbols between them into wilds. Finally, when the x2 Multiplier Wilds feature is launched, all your wins that will include at least 1 wild symbol will be multiplied by 2.